I am a Berlin based digital entrepreneur. This blogs helps me write down and formalize some of my thoughts. I am an expert on most topics digital and an amateur on most other topics I write about. Does the facebook algorithm favor right wing content? nimda on Does the facebook algorithm favor right wing content? Falk Steiner on Does the facebook algorithm favor right wing content? I am a digital entrepreneur. I have been running digital campaigns since 2010. My first campaigns on facebook were in 2011. While much has changed, much has also stayed the same. I am also politically active. I am a convinced believer in pluralism and democracy. As such it is highly frustrating to me how most European political parties are reacting to the changes in digital communication. Speaking to politicians and journalists in Berlin they tell me that social media platforms such as facebook, instagram and twitter favor extreme content, giving right wing parties an unfair advantage in their online campaigning. What’s closer to the truth? Right wing parties like Germany’s AFD are new. They started out as facebook discussions, facebook events and facebook groups, slowly growing into something more solid over time. This means that by default they deeply understand digital communication at a completely different level from established parties. Established political parties think they understand digital. They think they are running digital campaigns, because they also have facebook and twitter accounts. In truth they are not. CDU and SPD, historically Germany’s two largest parties have 185.000 and 188.000 facebook fans respectively. Together they have 373.000 fans. AFD has 444.000 facebook fans. They have more facebook fans than CDU and SPD together. It seems like they are twice as good at digital communication as either CDU or SPD. Looking at the details however yields a completely different image. 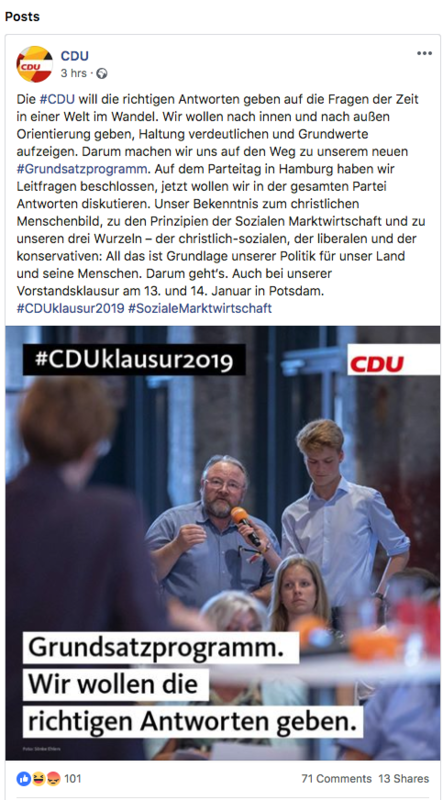 CDU had 22.000 engagements (reactions*, comments and shares) with their posts in the last 28 days. No, that number is not a typo. AFD is almost factor 10x bigger than CDU and SPD combined. CDU had 5.366.000 views (impressions) of their posts in the last 28 days. The AFD posts reached roughly 15x as many eye balls as posts by the CDU. Just to put 81.389.000 into perspective. Germany’s biggest tabloid Bild Zeitung prints 1.582.221 copies per day on average. 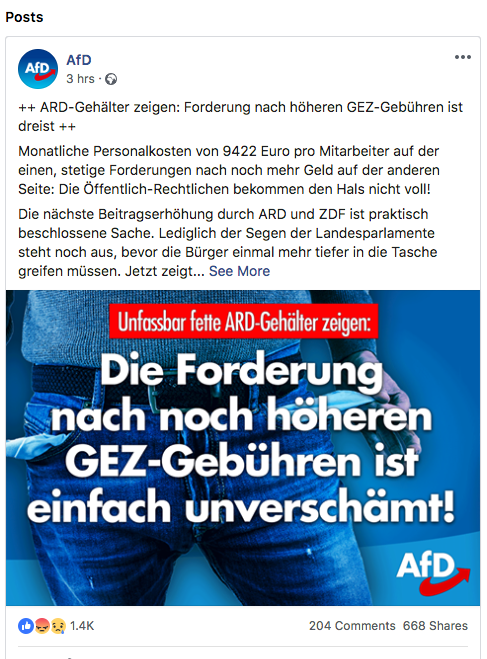 Of course a single facebook post has less value than a full newspaper, but the comparison still shows that the AFD facebook page is probably one of Germany’s biggest media outlets. By owning one of Germany’s biggest media outlets AFD can get their message to voters completely unfiltered and presented exactly as they want. They can also effectively capture and set the agenda across the entire media landscape. In the old days (and this is still how most European politicians think) you craft your message in a format that is appealing to newspaper editors (e.g. by holding press conferences). The newspaper takes your message, the journalist adds his/her own analysis of your position, responses from other politicians, etc., the newspaper gets printed and reaches millions of voters. In the new days, if you craft your message in a format that is appealing to social media users, you can reach millions of voters directly. They read your message unchanged and unfiltered. It is directly your message. If you reach enough people your message becomes relevant and newspapers will write about your message, providing you with additional distribution. Why does the AFD reach so many more people than CDU or SPD on social media? Does the facebook algorithm favor right wing content? Let’s try to break this down. So half of the effect that AFD reaches more people is that CDU and SPD are inadequately staffing their social media teams. Since they are much bigger organizations they should have the funds to have proper in house teams that continuously communicate with voters. It seems like CDU and SPD are too lazy, but really they have misallocated resources, because they don’t understand. 2) An avg. AFD post reached an estimated 4x as many people (4.0x for CDU, 3.6x for SPD). The biggest factor here is that they reached ca. 4x as many likes and 10x as many shares per post. Is this because facebook favors right wing content? The answer is no. AFD has a full time social media team that continuously monitors the European media and social media landscape. They look for interesting stories and then re-package them to make engaging and technically well crafted social media posts. They are social media professionals. CDU and SPD post boring marketing blah. Most of their content is suitable for an internal party newsletter or a billboard campaign. Most of their posts provide no added value to facebook users. If I find the time I will create an indepth analysis in a separate article comparing a representative selection of SPD, CDU and AFD posts. For now you can find the latest facebook post by each party in the appendix of this article. Social media is an incredibly important channel. Facebook, Instagram and Twitter may not be where the future lies, but they are the most important platforms for political communication today. The established European parties are providing insufficient funds to their social media teams. They believe that the over performance of parties like the AFD is inherent to Social Media. This narrative is wrong and dangerous. Given bigger and better social media teams SPD and CDU could reach larger audience numbers than the AFD. If established parties don’t take digital communication seriously then they will continue losing elections to new parties. Extremely inconcrete topic that probably interests no one that is not a CDU member. The CDU post translates to: “CDU – we want to give the right answers”. What is this even supposed to mean? 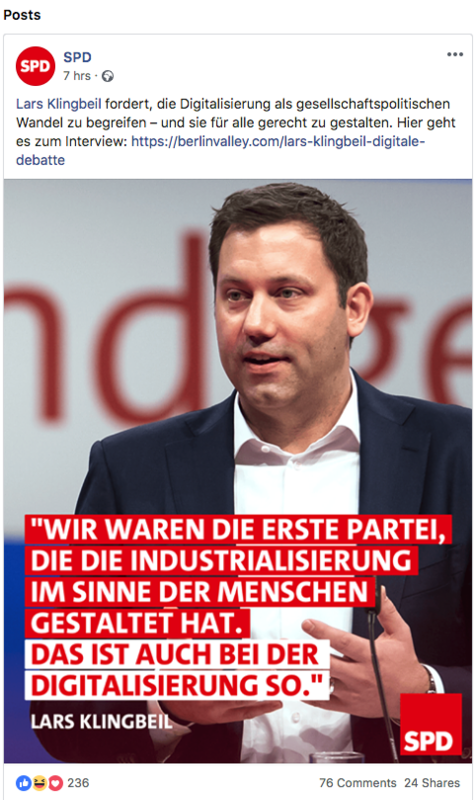 The SPD post essentially translates to: “We were the first party to make industrialization fair. We will do the same with digitalization”. Not exactly a specific demand. Sounds more like marketing blah to me. The AFD post compares the average wages of a public institution (9.400€ / month) with the demand by this institution to increase its budget. Reading the post I have the feeling I learned something. The demand seems reasonable and to not increase the budget of this institution is something many Germans agree with. They took information from a newspaper article and re-packaged it into a political demand. *reactions is the new name for the emojis that you can place next to a post (like, love, haha, anger, etc.). Typically this is mainly people liking a post (75%) with a few of each of the others woven in. And yes, right wing posts have a similar distribution between these categories as other parties. **This is based on a predictive model that is still work in progress, based on data for several political facebook pages for the years 2015-2017. Since then facebook has updated their news feed algorithm several times. 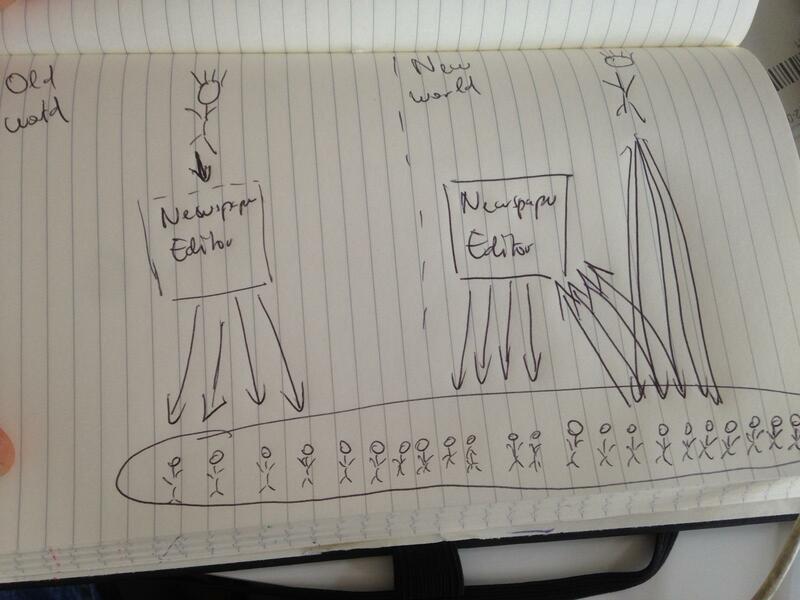 So our estimates for all pages may be too high, but should remain similar relative to each other. I will update this number if we get more data for the year 2018. Posted on January 10, 2019 January 10, 2019 3 Comments on Does the facebook algorithm favor right wing content?